“To my mind, the most beautiful and powerful visual realizations of this notion of Strange Loops exist in the work of the Dutch graphic artist M. C. Escher, who lived from 1902 to 1972. Escher was the creator of some of the most intellectually stimulating drawings of all time. Many of them have their origin in paradox, illusion, or double-meaning. 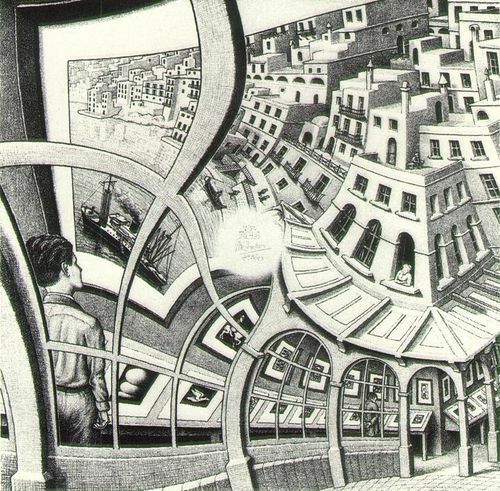 Mathematicians were among the first admirers of Escher’s drawings, and this is understandable because they often are based on mathematical principles of symmetry or pattern… But there is much more to a typical Escher drawing than just symmetry or pattern; there is often an underlying idea, realized in artistic form. And in particular, the Strange Loop is one of the most recurrent themes in Escher’s work. Look, for example, at the lithograph Waterfall, 1961 (Fig. 5), and compare its six-step endlessly falling loop with the six-step endlessly rising loop of the J.S. Bach’s “Canon per Tonos”. The similarity of vision is remarkable. Bach and Escher are playing one single theme in two different “keys”: music and art. Escher realized Strange Loops in several different ways, and they can be arranged according to the tightness of the loop. The lithograph Ascending and Descending, 1960 (Fig. 6), in which monks trudge forever in loops, is the loosest version, since it involves so many steps before the starting point is regained. This entry was posted on Friday, May 4th, 2018 at 00:02	and is filed under Uncategorized. You can follow any responses to this entry through the RSS 2.0 feed. Both comments and pings are currently closed.